In Goodbye Stranger, Rebecca Stead's forthcoming fourth novel for young readers, several characters are struggling with life's ups and downs. Bridget "Bridge" Barsamian, who survived a terrible accident as a young child, wonders if she was spared for a special reason. She and her best friends, Tab and Emily, also face new challenges as they enter middle school and begin to question whether their pact never to have a fight is actually helping their friendship. In the meantime, Bridget grows closer to classmate Sherm Russo, who is mourning the demise of his grandparents' marriage, which causes his grandfather to move out of the family home, leaving Sherm behind. Scenes from Bridget's life are interspersed with letters from Sherm to his grandfather, and a series of scenes written in the second person that reveal what happens to one unnamed character on Valentine's Day. Goodbye Stranger has a sophisticated structure. The changes in tense, format, and point of view are confusing at first, but as the reader gets to know each character, switching between their stories starts to feel more natural, and the desire to know the outcome of each thread of the story becomes stronger. Despite Stead's poetic and descriptive style, the pace of the book is quick because the reader is constantly questioning the identity of the character in the Valentine's Day story and the future of Bridget and her friends. (Snappy dialogue also contributes to this.) Stead also does a nice job of incorporating social media and cyberbullying into her story in a timely and age-appropriate way that feels real and not gimmicky. She depicts life in middle school accurately, without sensationalizing its problems or understating its pleasures, which is completely refreshing. The Valentine's Day thread is the weakest part of this book, mostly because there is no real mystery surrounding the girl's identity, and her experiences don't connect as strongly to the rest of the story as the reader is led to expect. When her identity is revealed, it is a major let-down because it doesn't add anything to the overall story. There is no real "puzzle" in this book, as there is in When You Reach Me and Liar & Spy, and that is both unexpected and disappointing, given the set-up. Still, the other threads of the story are so strong, it's impossible not to forgive Stead for this one shortcoming. 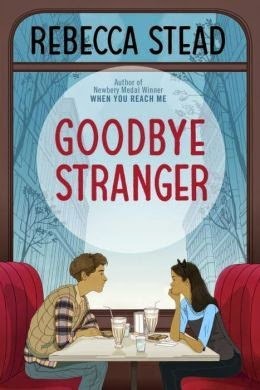 Because Stead is a talented writer with a distinctive style, Goodbye Stranger automatically stands out as special among middle grade titles, even thought the subject matter itself has been explored in fiction many times over. Similar books include Criss Cross by Lynne Rae Perkins, A Song for Bijou by Josh Farrar, The Battle of Darcy Lane by Tara Altebrando, and The Darlings are Forever by Melissa Kantor. I'm not a huge fan of multiple POV's but if my favorite author, Rebecca Stead, is driving the ship then I'm in. Thanks for the heads-up on this one. Oooooh, my anticipation for this book had increased!!! Thanks for the review! I've really enjoyed Stead's other book, especially When You Reach Me. Thanks for featuring this one. I'll be sure to check it out! I like Stead's writing, so I will be looking for this one. Thanks for the review.